If you are wondering how to accomplish your desire to learn new skills or polish up on ones you have forgotten, then this book is a must read. The author begins with some amazing encouragement – that is, we are not limited by genetic disposition. By leveraging scientific observations explaining how the brain works to learn and retain new talents we are encouraged to pursue those skills we have long desired to know. He addresses the issue of a “fixed mindset” that would wrongly conclude that we are simply good at some things and bad at others. The author presents a convincing argument that with focused intelligent learning we can reach our goals of obtaining new skills. He does this by explaining what skill acquisition means. He gives clear and simple steps on how to identify the new skills you may want to learn. He follows this with principles of effective learning. He then demonstrates these ground rules by learning new skills himself. This book is encouraging, simple and easy to apply. This is not a “feel good” book that pumps you up then leaves you to figure out how to proceed on your own. It takes you by the hand and demonstrates how new skills are learned. This book is for anyone who has a list of skills they want to learn, but has convinced themselves they do not have time or the talent to actually learn them. A competitive edge can come through the form of a better gulf game, learning a new language or learning to relax through playing an instrument. An enriched life translates into an enriched business. 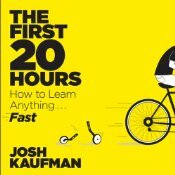 Breaking down how to identify and learn new skills as this book does, clearly demonstrates I have the time and ability to become reasonably good at those things I have had on my list for a long time. This entry was posted in Good Books & Papers and tagged book review, First 20 Hours, Larry Lawhead. Bookmark the permalink.